All the teachers at Embrace The Moon are certified and expertly trained in the methods they teach. Our three year program is unique to many in that it includes a wide knowledge base, strong skills development and a long apprenticeship. Teachers receive training in Anatomy, Kinesiology, Chinese Medicine, and Taoism along with rigorous form practice and correction, and extensive comprehension in form modification for special health needs. Our teachers are sought after and teach in a variety of settings. Those that teach at Embrace The Moon are chosen by Kimberly Ivy personally because they have the experience, skill and heart to steward their students through the breadth and depth of the practice experience. Take their classes. Learn, laugh and enjoy! Joyce Broderson came to the internal arts a bit later in life (though you would never know it!) She now shares her joy of practice with the joy of being a grandma – twice! Over the past 22 years of ongoing training, Joyce has become expertly skilled in Taijiquan, the Hands of the 18 Luohan and several forms of Qigong. Mrs. Broderson’s main interest is, however, not in form per se but in the internal quiet and strength these arts develop. Joyce is respected throughout the school for her capacity to stay present and in the moment during each class and for her ability to communicate this challenging aspect of the practices to others. Embrace The Moon is lucky to have Joyce as its senior instructor, sharing her gracious intuitive skill in sensing and working with internal energy. In addition to her classes, she also hosts workshops on Mastering the Art of Slowness. All levels of skill benefit. Kim awarded Joyce the title of "Laoshi" or senior instructor in 2010. Read A Conversation with Joyce. Andrew has been a student at Embrace the Moon for 22 years, participating at a very fundamental level with the evolution of the school from the beginning, in all of its incarnations. He was the first teacher after Kim to become certified in Soaring Crane, Chinese Essence and Turtle Longevity Qigong. In addition, he is certified to teach Thousand Hands Buddha, and Jade Body Qigong. Andrew has also studied Muscle Tendon Changing, Hun Yun Gong, Meridian Longevity Qigong, and the 18 Hands of the Luohan. On the Tai Chi side, he has studied Yang Tai Chi for many year and recently started learning Chen. He welcomes the challenges that come with being a beginner. Andrew’s career as a producer of live events, conferences, and touring exhibitions keep him traveling, and his love of the outdoors frequently calls him there, but you may see him in class or covering a Qigong class for one of his fellow teachers. Doug began studying Eastern philosophy and mind/body practices in his early teens. The Buddhist sutras, the I Ching, Yoga, and Meditation were his early teachers and his curiosity about the energetic nature of our body/mind drew him to study Herbology, Iridology, Reflexology and the Touch for Health system of Kinesiology. In the 1980’s Doug became particularly drawn to Yogananda, becoming a disciple, and practicing the Self-Realization techniques for many years. Doug came to Embrace the Moon in 2007 after a serious illness, looking to Qigong and Taijiquan to help restore his health and strength. Doug is certified in Chen Taijiquan, Hands of the 18 Luohan, Muscle Tendon Changing and the Eight Treasures. You will enjoy not only his ability to demonstrate the forms well but also his innovative capacity to explain the core basics in a fun and accessible way. And don’t let that broad smile fool you! You will know you had a workout! When he is not on the floor he is managing website portals, riding horses with his wife Patty and enjoying time with his large and loving family. Laura Quandt spent the first part of her career in corporate customer training in the Chicago area. As her life unfolded she found herself increasingly called away from the office and into the human body & mind. She earned a black belt in Uechi Ryu Karate, a AAS Degree in Fitness Specialist/Personal Training program and was certified by the ACSM (American College of Sports Medicine) as a Health/Fitness Specialist. 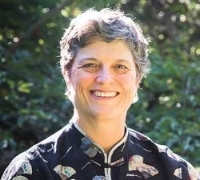 Laura became a student of Taijiquan and Qigong in 2005 when she was in constant back pain and had very low energy during a particularly dreary Seattle fall and winter. She found Taijiquan and Qigong both useful and inspiring and has been a consistent and dedicated student of these arts since. In all her classes Laura integrates her comprehensive knowledge of physical biomechanics, energetic flows and mental focus with her spirited and lively communication style. Since becoming an “empty nester” in 2015, Laura has begun fulfilling wishes on her bucket list, starting with traveling to sunny destinations and visiting friends and family, piano lessons and self-teaching ukulele. Larry Spangler has a lifelong interest in anatomy and the biomechanics of movement. His interest led to a career as an occupational therapist specializing in geriatric rehabilitation, and to the study of the internal arts of Taijiquan and Qigong. Larry began training at Embrace The Moon in 2005. He became a certified Qigong teacher of the Hands of the 18 Luohan and Muscle Tendon Changing Qigong in 2013. Larry is also a certified Bowen therapist and student of tensegrity medicine at the Northwest School of Structural Medicine. He delights in sharing the discipline of qigong to improve one’s health and well-being. In his love of movement and music he has studied ballet, African and jazz dance and has been an amateur classical guitarist for 4 decades. Larry also has not-so-secret passions for vintage VW's and cooking! Larry teaches a variety of Qigong and Yang style Tai Chi classes throughout the week for all age and income levels. His classes are in Ballard & Greenwood. Contact Larry here for his schedule. "Embrace the Moon is a safe, challenging, invigorating, and supportive space for improving physical and mental capacity." As an engineering geologist accustomed to charging up steep hillsides, in 2010, Bill felt his energy waning, and looked around for a martial art to fit his age and mentality. He found that Embrace the Moon fit him perfectly. When Embrace the Moon taught Yang Style, Bill learned and became skilled in both Yang short and long Taijiquan forms. He found the “spring was back in his step”. Bill continues his Yang practice, and has also taken on the challenge of Chen Taijiquan. Bill is a Vietnam War combat veteran with a compassion for other veterans. In 2014, Kim certified Bill in Yang Style and he created a Taijiquan program for the Seattle Veterans Center. He continues teach weekly classes there, and is rewarded by the improvements in veterans’ lives through Taijiquan. Nina Maluda loves to move. She grew up a dancer and her love of the art shaped her career as an internationally acclaimed costume designer for ice dancers, ballroom dancers and other movement athletes. She is a Master Fabric and Element Design Artist and her work can be seen glistening on the spiraling forms of Olympic ice skaters. Nina has studied Shamanism for many years, traveling to Costa Rica, Mongolia, China and Bali to more deeply acquaint herself with the people and ancient traditions. Her own company, Feather and Stone, emerged as a response to the sacred designs she found deep within these cultures and traditions. Not only is Nina an Embrace The Moon certified instructor of Qigong, she is also a long time practitioner of Yoga and remains a Wild Traveller. Karri was drawn to Qigong practice after taking just half a seminar on the Luohan Gong in 2004. Karri loves the way Qigong allows one to develop a deep sense of listening to the body and enhances the ability to fine tune movement using the mind, breath and proper alignment. She is a regular student and frequent substitute teacher at Embrace the Moon. Karri is also Chief Instructor at Quantum Martial Arts where she teaches both the Quantum style and Qigong. When not teaching or training, Karri can be found caring for her 3 dogs and two cats, crocheting, or riding her motorcycle. You can find Karri’s Qigong classes at Quantum Martial Arts in Seattle's Central District on Tuesday nights at 6:45. Check the schedule or email Karri. Scooter has been a member of Team Moon for five years. From the beginning Scott has had what it takes to perceive and coordinate the inside body/mind with the outside expression. His diligent daily practice and intention to work on a deep level with Taijiquan and Qigong has accelerated his progress through the curriculum. Within the first year at Embrace The Moon Kim recognized his innate talent for teaching and was thrilled when Scott approached her about the Training Program. She put him to work right away assisting her in the larger classes. With a wealth of intuitive and creative methods for imparting information with skill and humor, beginners love Scooter accessible way of conveying unfamiliar concepts and movements. Scott (aka Scooter) is a graduate of Carnegie Mellon University and when not working in video design and production or practicing Taijiquan, he can be found at his spinning wheel plying alpaca, wool and silk. In addition to helping beginners along their way and substitute teaching the advanced classes at the main school, Scooter teaches seated Taijiquan and Ba Duan Jin Qigong (the 8 Treasures Qigong) at Brookdale Senior Living in Queen Anne. Scott is also the lead creative consultant and production manager for Embrace The Moon’s video training series. Nicholas began his formal study of Chen Taijiquan at Embrace the Moon in 2014, at the urging of his wife. He took the first steps on that path nearly a decade earlier while studying Sun and Yang style Taijiquan in Southern California. During that time he had the occasion to see a demonstration by Chen Bing. After the demonstration he set two goals: to learn Chen Taijiquan and to travel to Chen Village to train in its birthplace. The first goal is an ongoing effort. The second was accomplished in 2016. When not on the floor he can be found practicing a variety of weapons outdoors, in his kitchen making everything from scratch or at home enjoying the company of his wife and three dogs.